← The Radio Ranger Rc Fishing Boat in Florida Catches a Jack, LadyFish, and Snook! Great boat for catching bait fish; what do you do when a 10 lb.fish hits?????? Good Question Bill. With a plain rc boat with a fixed line attached that couold present a problem. It’s doubtful that any remote control fishing boat that does not have a fishing line release system, (like The Rc Fishing Pole) could pull in a massive fish or any fish that is proportionatly bigger than the actual boat itself. The Rc Fishing Ploe, (as seen in the story) deos indeed have a fishing line release system. In other words you could use one of the boats in the story with The RC Fishing Pole to deliver your line, say 400 feet…you can then choose to release the line. It wouldn’t matter if a “MAKO SHARK” takes the bait…..The line will disconnect from the boat…and you will reel in the fish with your fishing rod. Now that would be great if these rc boats could pull in a MAKO SHARK without a fishing rod. But as of yet the old saying stands, “You’re going to need a Bigger Boat”! You should mount a ros and reel on deck that can actually reel in a fish; that is a REAL FISHING BOAT!! Not a person with a rod and reel standing on shore. Still a great idea. Good question Bill. 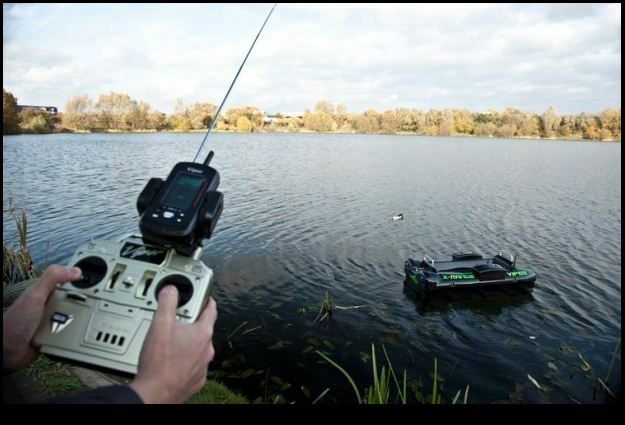 Did you know with “The RC Fishing Pole” you also get a line release feature? Let me explain, attach the fishing line from your fishing rod to the RC Fishing Pole, then instead of casting you can drive your line out. The advantage of the line release is if you are after BIG Fish, literally you can catch any size fish no matter how big. Once the fish hits, the line will release from the boat, and then you reel in. Another feature is that you can drop your line anywhere you want. But for fun, we do like to use the boat to pull in the fish, keeping in mind though if you’re fishing for big fish we recommend using the line release feature. Great idea. I have designed and built a 4 foot twin screw remote control fishing boat with a workable rod anr reel mounted on deck that can not only reel in a fish up to 15 lbs. buty you can tighten or loosen the reel drag all by RC. Has a 1/4 mile range and can fish for 3 hours.